I cannot remember a time in my professional experience when matters of context and principle have intruded so insistently into the project of teaching the next generation of students. This year, in the midst of our rituals of welcome and celebration, we find ourselves confronted with brazen displays of racism, anti-Semitism, hatred, and violence in Charlottesville, with frequent accounts of racially motivated killings in cities across our country, and with a national discourse driven too often by impulse rather than informed thought and laced with intolerance, dishonesty, and verbal violence. It suddenly feels urgent to bring to consciousness — for ourselves and our students — the values that shape the education we offer here at Bates. Some of these values are the foundational commitments of the liberal arts, which we take for granted at our peril. Other values may be, in fact, unexamined assumptions about what and how we teach that can have a distorting impact on both the content of the curriculum and the success of our students. Only if we examine our animating values can we hope to understand what is at stake in the current national context and how we can play our part in putting things right. The Bates mission statement frames the project of education in a radical and distinctive way. We invoke the “emancipating potential of the liberal arts,” and we invite our students to engage “the transformative power of our differences, cultivating intellectual discovery and informed civic action.” These principles were revisited and restated by the Bates community in 2010, and I would suggest that they need to be brought to the surface with fierce attention in the fall of 2017. Expertise matters, because it brings the promise of making lives — and life on this planet — better. We believe in truth. We believe that knowledge is hard won, and that meaning is a personal struggle that each of us tackles in our own way. We believe that learning is more powerful when it happens in community with the inspiration of dedicated teachers and scholars and the solidarity of friends and fellow travelers. We understand that hard problems do not admit of glib or easy answers. Rather they are solved incrementally and over time, often with painstaking work that builds on the knowledge of previous generations and gains strength through the insights of contemporary colleagues. This is called expertise. It is developed in institutions like colleges and universities, and it is safeguarded by respect for standards of inquiry and expression. Expertise matters, because it brings the promise of making lives — and life on this planet — better. We teach our students to reason from evidence. We believe that facts matter. A college campus is a culture that depends on persuasion and reason-giving, not on authority derived from power or position. We give reasons for believing that something is true, because we trust in the good faith and agency of others, including the agency to freely disagree. These principles make open and robust discourse on a college campus possible, they make democracy possible, and they make it possible for us to cultivate our common humanity. Bates was founded on the principle that education is meant to develop the full potential of every human being. We achieve this goal by treating all persons as equal and worthy. 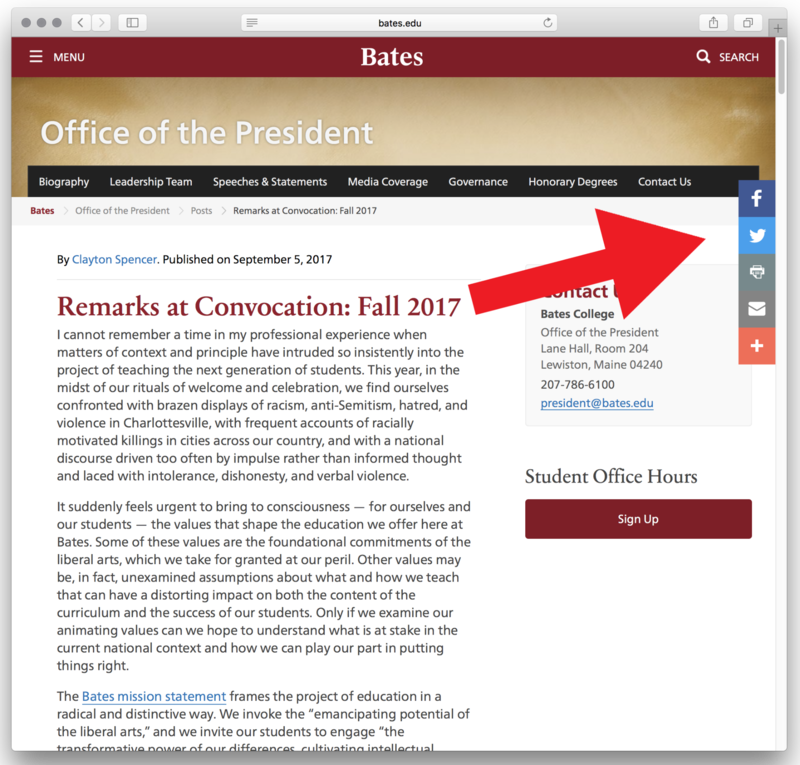 An offer of admission to Bates is a validation of talent and ambition and a vote of confidence in the ability of every student to engage the full promise of a Bates education. As we have learned repeatedly, and painfully, over the past several years, however, there remains a gap at Bates between our ideals of equality and the lived experience of some of our students. It is imperative, therefore, that we persevere in the hard work of examining our curriculum and teaching, together with the formal and informal structures that define student life, to make sure that we cease to perpetuate assumptions or practices that exclude groups of students or diminish their experience. We believe that engaging with difference is a powerful force for good. In education, it is a source of growth and transformation — whether difference is encountered in the person or point of view of another human being, in a difficult text, or in a problem set or experiment using tools and methods new to us. We encourage our students to approach ideas and each other with openness and generosity. This is not a time to lose heart — it is a time to take up our work with new resolve. We are explicit, at Bates, that we mean to educate the “whole person.” The liberal arts have always been about head and heart, knowledge and wisdom, expertise and empathy. As Bryan Stevenson’s riveting memoir, Just Mercy, so powerfully illustrates, what we do and the choices we make matter every bit as much as what we know. As we move into the new academic year, we have our work cut out for us. Never has the humanistic project of the liberal arts been more important. Never has this form of education been more needed — or more challenged. This is not a time to lose heart — it is a time to take up our work with new resolve. It is inspiring to work with students as they learn to find their way and begin to ask themselves what they can do to make the world a better place. This is the promise of Bates, and it is up to all of us, as a college and a community, to carry it forward. Right on! I am never so proud of being a Batesie. Thank you for being clear in communicating your mission and values. As Bates parents, this makes us even more confident in knowing that our son, Arthur Churchwell (who is currently studying in New Zealand), made the best choice in selecting your institution. Thank you for the invitation to contribute to the conversation. Inspirational words, beautifully and powerfully presented. I was just hoping that there would be some mention of the incident at the end of last year when a black student was treated with unnecessary force and a lack of respect by Bates’ all-white police force. 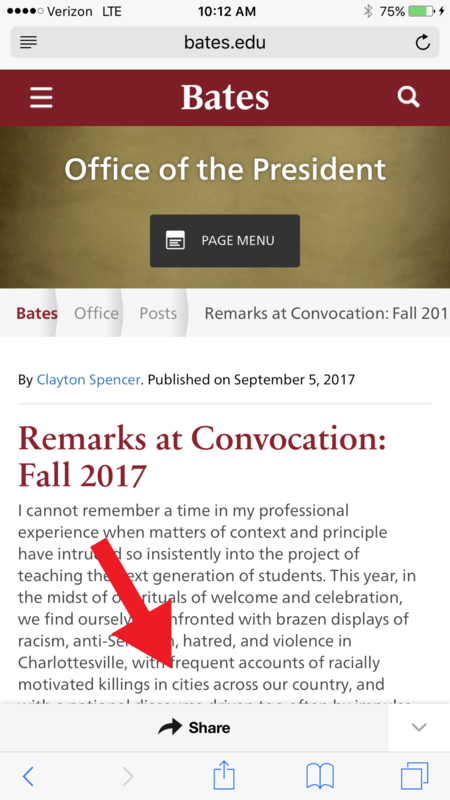 That incident and what they saw as Bates’ inadequate response left a lot of the students I spoke with shaken and doubting the sincerity of Bates’ commitment to diversity and social justice. Thanks for making this clear statement in support of our shared Bates values of equity, civility, and above all compassion. Brava, President Spencer! Thank you for articulating and defending the urgent need for a liberal arts education. As Bud Horne wrote above, I have never been prouder to be a Batesie. Thank you for saying so eloquently what is really important in this world, and what Bates is doing to support it. We treasure you efforts. There were no fraternities or sororities. I wanted to be an equal of every member of the class in a nonjudgemental community and to reciprocate that feeling to my classmates. And The Outing Club was open to all no matter what activites we chose to participate in. Thank you for admitting me to that kind of community! Proud to be a Bobcat parent. Thank you for such a beautiful rallying cry for both the liberal arts and Bates! The right words at the right time. I am proud, and delighted, to be the parent of a Bates student. Thank you for your resolve and for your hard work. Thank you for speaking out. I think Bates’ focus on educating the whole person is visible in what many Batesies do. Three days ago I was stuck in Nome (a small isolated town in northern Alaska) and met a young woman who had just started teaching high school social science there. The conversation pretty quickly turned to the need for teaching citizenship and engaging students strongly in their communities. I wasn’t surprised to discover we are both Batesies. The spirit embodied in your text above shone through in her work. BRILLIANTLY ARTICULATED! FROM THE FIRST SENTENCE, MY HEART WAS CLENCHED AND MY EYES FILLED WITH TEARS. I CAN’T BELIEVE THE TIMES WE ARE LIVING IN. THANK YOU FOR DIGGING IN AND COMMITTING TO THE “REASON” OF A LIBERAL ARTS EDUCATION. PROUD TO BE A BATESIE ’13 ALUMNA PARENT. This is particularly well thought out and well prepared. It is both sound and sublime; it frames these crucial issues and engages them; without didactic instructional tutorial. This is a college leader, talking to all of us. Obviously, I am listening. Thank you. I hope that this is the kind of message being given at colleges and universities all over the nation. These are ideas that need to be embraced now and always. Should be required reading for all Bates students. Say Hallelujah! My inner Mr. Spock is rejoicing (if he had feelings of course). Thank you for your comforting and hopeful message. Thank you for sending this statement to alumni. As atrocities in national leadership unfold, alumni wonder what upcoming generations hear from mentors. This powerful comment is reassuring. After reading your very articulate remarks, I am more convinced than ever that our son Allen has chosen the perfect place for his education! Thank you Clayton for your thoughtful and articulate remarks. We stand together in caring about Bates’ impact on the world. Very happy to hear your thoughtful remarks, and once again feeling so fortunate that our daughter is a Batesie. A profound and eloquent mission statement for a university and, by extension, a repudiation of the obscurantist impulses currently animating American government and politics. This is a very important message for the Bates community and it has been delivered with great eloquence. Well said, Educate “whole person”! We are are proud to be the class 2021 Bates parents. Thanks for reinforcing Bates educational values during these challenging times. It provides optimism that a liberal arts education will continue to be a resource of caring and thoughtful contributors to a progressive society. Thank you for sending this thoughtful address to your new students. My daughter is a junior on campus and I am reading from a distant Washington state. I would encourage you to find a way to share this text with high school juniors and seniors who have expressed interest in Bates. It communicates very effectively the heart and intention our family has found there. It’s been 62 years since I graduated from Bates. The changes since then have been overwhelming. However, it’s comforting to note that what’s really important remains solidly In place. I couldn’t be more proud of my alma mater! Thank you for sharing your message. I hope this will continue. I also hope that we all will be truly open and willing to truly listen also to ideas that we do not like and/or agree with. So well articulated! As parents of a current student, we are happy that our extensive college search (across the world!) four years ago helped us discover Bates, which was relatively unknown back here in India. “The transformative power of our differences…” from the mission statement did strike a chord then, and we are glad that you have emphasized it again.Wish there was a FB/twitter handle on the page for sharing the inspiring words!